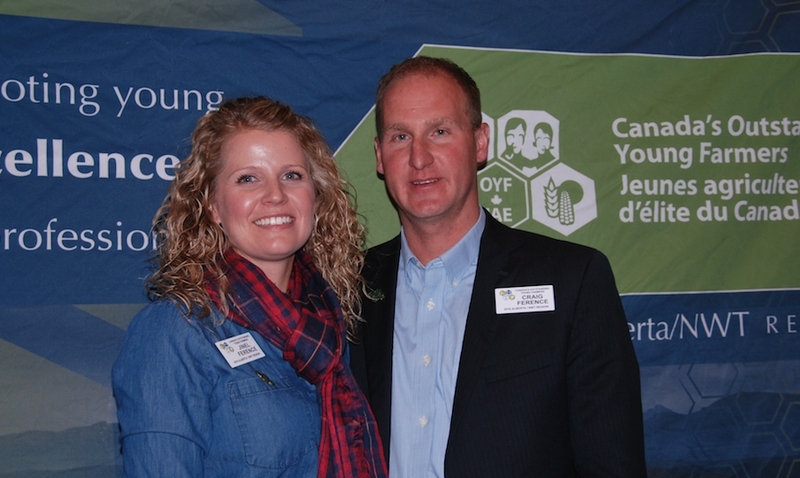 More than 60 people gathered to honour fourth generation farmers Craig and Jinel Ference of Double F Farms (located in Kirriemuir) as Alberta’s Outstanding Young Farmers for 2018. The winners were announced at the Alberta regional event held at the Pomeroy Inn & Suites in Olds, Alta., on February 9. After receiving university degrees, in Ag-business for Craig and Education for Jinel, they returned to take on the responsibilities of full-time farming in 2004 and today crop 10,000 acres, manage an 8,000 head feedlot and 4,000 mother cows, as well as a number of custom farming contracts. Their goal today continues to be one of creating a diverse business that involves many agriculture sectors. As caretakers of the land, Craig and Jinel focus on improving the land for future generations by increasing organic matter from one to four per cent. New technology in product and equipment advancements continues to bring change to their farming techniques both in Alberta and their new expanded operation in Biggar, Sask. and winners Craig and Jinel Ference, Double F Farms, Kirriemuir,AB. Canada’s Outstanding Young Farmers for 2018 will be chosen at the National Event in Winnipeg, MB from November 29 – December 3, 2018.